Jotform gives you a wide variety of ways to customize how a form is rendered. An example of customization can be found on this guide: Customize your Form using Custom CSS Codes. 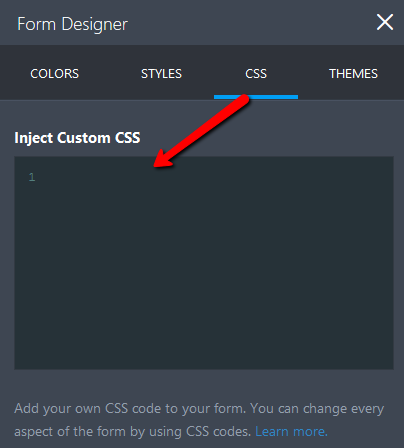 In this guide, you'll learn how to inject a custom CSS codes to the form. 1. In the form builder, click the Design icon. 2. Click on the CSS tab, and paste the code in the "Inject Custom CSS" area. 3. Make sure to click on the Save button. Having difficulties with the custom CSS? Please let us know in the comment box below or heads up to our support forum and create a new post explaining your issue. The custom CSS injection option isn't available for Single Question forms. All my Single Question Jotforms have way too large of a top margin. How can I fix them? I am looking to customize the widgets in my form, to match the font family and style that is used in the rest of the form, how? Can you please provide a sample? TIA! My form does not populate the phone number after it's been published. I am trying to put Hebrew text in my form in a few places. Here is the html I have for a Hebrew keyboard. It does not seem to work. Hi, How can i make integration between driving distance widget to form calculation ? as if once the distance calculated, it's show ing at the form calculatioin? please help. how? Hi, I'm using the table option to get the answers from my client but how do I limit the entry to only values ? For eg. Minimum 0 - Maximum 2 for individual cells? Hi, i have copied the submit code into the css part. However, it doesn't seems to show the submit button at the end of the page. Please help. Thank you. I'm trying to create a PayPal link to collect an application fee for my form. I've tried every option on your site with no success. Can you help? Thanks! Nothing changes -- even though I've saved it. Is this up to date? I don't see 'styles' and 'css' in my form editor drawer. Or is this available only on paid plans? Can any of you help me with the css function text transform? I would like to transform input from all text fields to first lower cases and then capitalize to avoid inputs in all caps. I got the code to work, BUT I'm having issues getting copied/pasted data to format. Where do I find a CSS section in the Designer? If I want to custom one field, how can I find the selector ? Editing form CSS is not there. Are you going to fix it and if yes, when? Can you help me get rid of the grey color in the questions that have a input grid? How do I change the color of the basic Input Table and the font color? I want to use the preview before submit widget but would only like the preview to show the fields that have been filled rather than a preview of the entire form. Is this possible? I can't find the CSS tab.. did you change the design? This is not possible in my form https://www.jotform.com/build/81982792368474. I would like to change the direction of the form going from right to left. I want the filled in names to appear automaticly in capitals. How do I do this? When i put Image Upload Preview appear the image on screen. Its possible or exit the same stuff but for videos? What exist dont show the videos on screen just appear the link of video. Looking at the custom date picker, but I want to limit the drop-down to Years only 1975, 1976, 1977 etc, how can I do this? Or is there a better way to do this? Getting a message saying IP address has been banned because of possible phishing attempt. Tried to fill in form but I can't remember username. Put email but when I click submit it freezes in "enter the message as its shown" but no message appears. Thank you for your help. Is there any way to verify the RTL option is working ? i used your CSS recommendation embedded here (https://www.jotform.com/answers/629135-Having-problems-in-creating-forms-in-Right-to-Left-language) and its seems like only part of the text is moving to the right (without the headers). Any solution which will allow me full RTL solution ? I don't have the custom CSS possibility. In my design menu I can choose: color, image and video. I'd like use custom CSS, is it still possible? When I click CSS in Forms Designer, all I get is a completely blank white page. how do i set the maximum size of image submission? Hi I am trying to change the color of the input boxes. I have entered teh css codes as described in previous posts. But do i need to enter it for each box or is there a general css code that applys to all input boxes?